The week began with a visit from St. John’s, a team the Devils had not seen since late November…and one of the few teams below Albany in the standings. Things got off on the right foot for the home team, as Joe Whitney scored his team leading 23rd (on a power play) 4 and a half minutes in for a 1-0 advantage. But Jason Jaffray would tie things up 6 minutes later. Second period the IceCaps would take over, as once again the Devils special teams struggled. 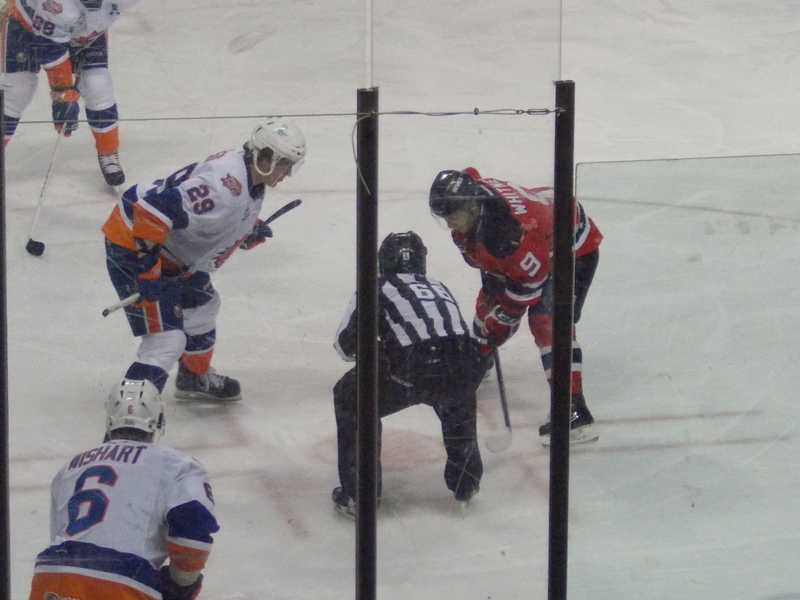 Eric O’Dell would score on a power play just 57 seconds into the period for a 2-1 lead, then a shorthanded goal by Aaron Gagnon less than 3 minutes later would put the Devils down 3-1. Gagnon would add his second goal of the day on a power play for a 4-1 lead in the third. Brandon Burlon would score his first goal of the season late in the game, but that’s all the Devils could manage, and they dropped their sixth in a row, falling further down in the standings. Hard luck night yet again for Jeff Frazee, as he stopped 17 of 21 shots in the loss. Four players each contributed an assist. 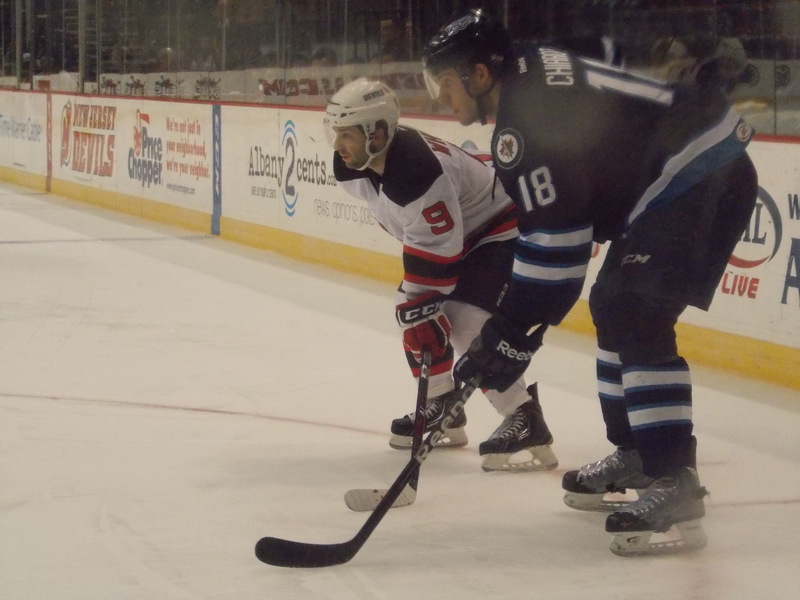 Friday the Devils had a chance to break the losing streak and gain some ground on the #8 seed, as the Bears made their only visit to the Capital Region this season. 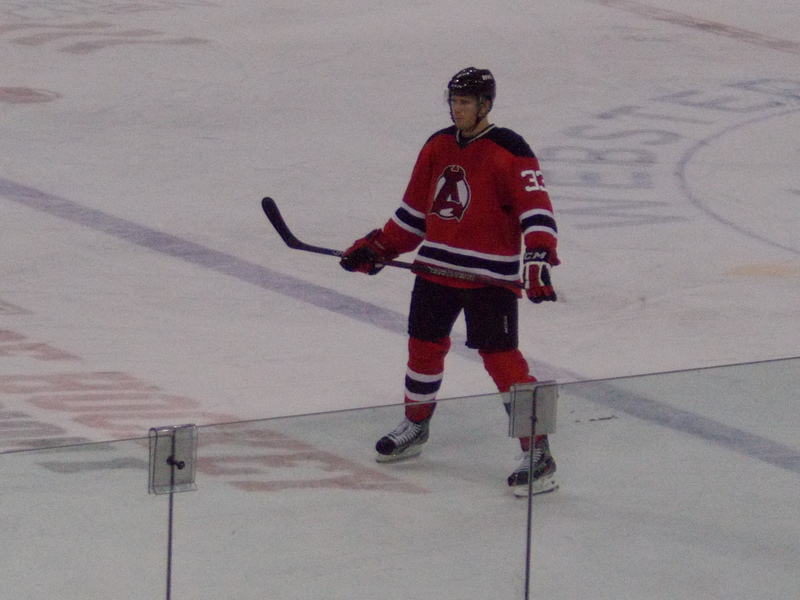 The game also marked the debut of defenseman Jon Merrill after he finished his junior season at Michigan. Things didn’t start out so well early on, as Peter Leblanc scored on a power play 4 and a half minutes in to give Hershey a 1-0 lead. Then just over a minute later, something no one had seen in two years happened: Cam Janssen scored a goal. He got a lucky tip in off a J.S. Berube shot past Bears goaltender Philipp Grubauer to tie the game at 1. It was his first goal at any level since March 2011 as a member of the St. Louis Blues; if you want to really dig further, it was his first AHL goal since October 2005, when as a member of the River Rats he scored against the Philadelphia Phantoms. Hershey dominated in scoring chances in the first, outshooting Albany 12-3. 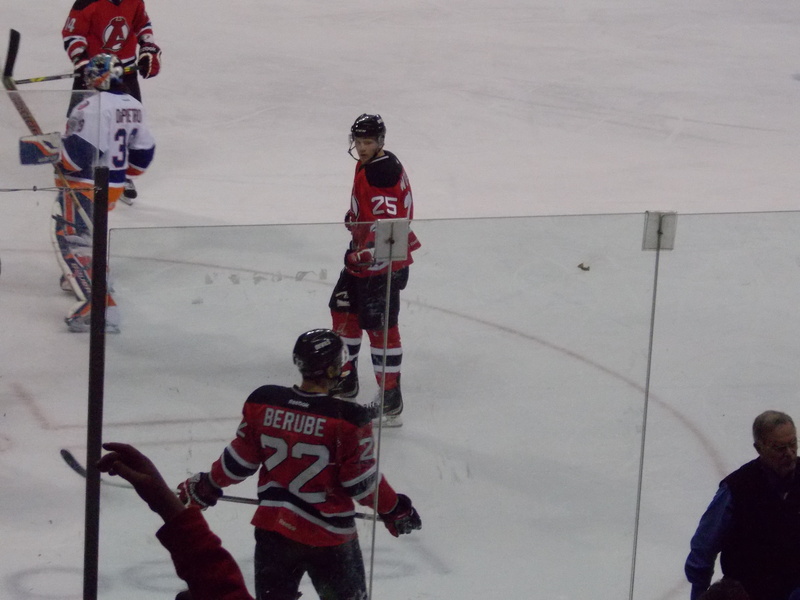 Darcy Zajac would break the tie early in the second…with an assist from Janssen and Alexander Urbom. Yes, Cam had a multi point game, all he needed was a fight for the Gordie Howe hat trick. Just when you thought you were in the Twilight Zone…Jay Leach would score less than three minutes later on a delayed penalty call for a 3-1 lead. Merrill would notch his first pro point with an assist on the goal. At that point, the Bears summoned Dany Sabourin out of the bullpen to take over for Grubauer, who gave up 3 goals on 7 shots…and gave up goals to people he really shouldn’t be allowing to score in the first place. The goalie shakeup helped the Bears a little, as Casey Wellman scored on a power play to bring Hershey back within a goal. 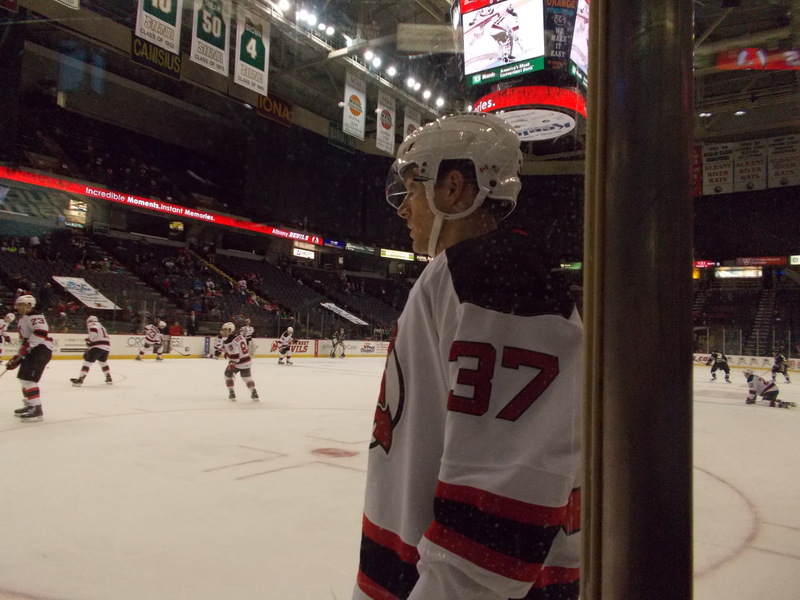 Joe Whitney would score an important insurance goal early in the third to re-establish the Devils 2 goal lead. How important was that? Joey Crabb would score 3 and a half minutes later to cut the lead back to one again. But the Devils would hang on to the lead…and even get an empty netter from the captain with 43 seconds remaining to seal the win and break the losing skid. 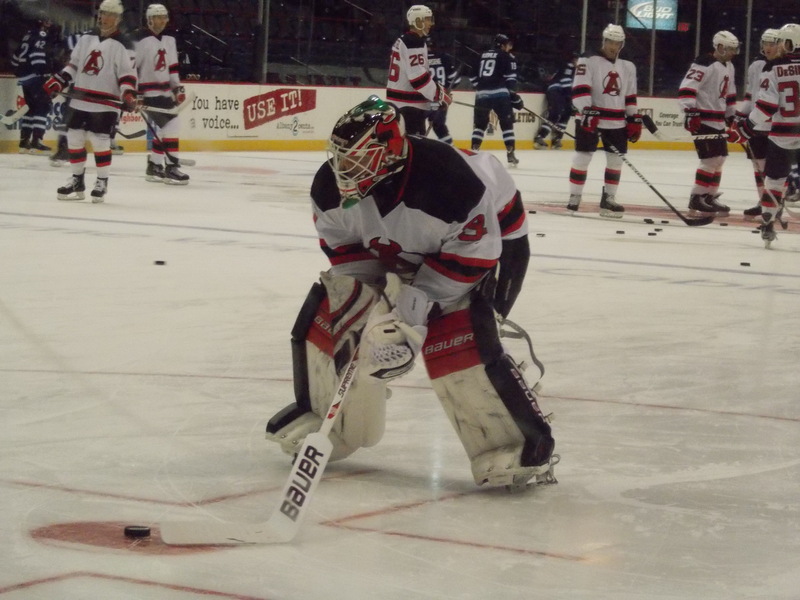 Keith Kinkaid played well after giving up the early goal, settling in to stop 28 of 31 shots. Merrill had an excellent debut, finishing a +2 and playing in all situations, mostly paired with Urbom. And you know it was one of those “did that just happen?” nights when Cam is a #2 star and Jay Leach (with his first 2 goal game in the AHL ever) is the #1. 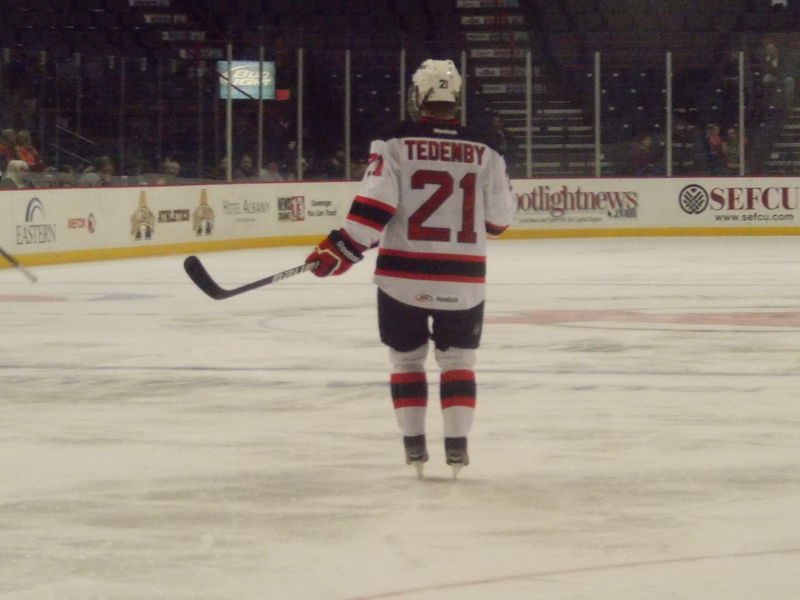 The Devils finished off the week taking on the Pirates, making their only visit to the Times Union Center this season. Two big stories emerged before the puck was dropped: forward Reid Boucher was making his first appearance of the season after signing an ATO on Friday (if you recall, he played in the final regular season game last season). The other big story? Mattias Tedenby, sporting a full face cage, was back on the ice for the first time since the skate cut incident in Adirondack over a month earlier. Just 55 seconds in, Andy Miele scored on a power play for an early 1-0 Pirate lead. 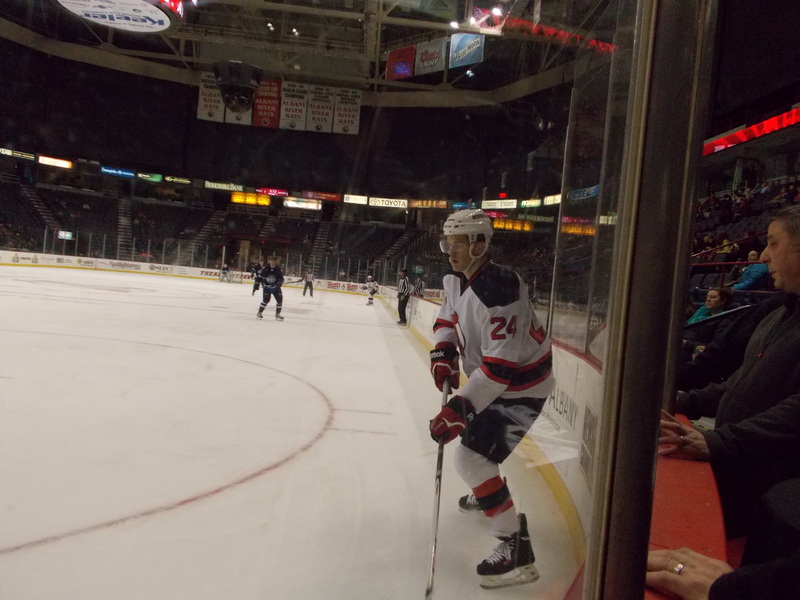 But Boucher would tie it up later in the period with a power play goal of his own, his first as a pro. Nick Johnson would give Portland the lead back late with his own power play goal. Much like the night before, the Devils were grossly outshot in the first, this time 18-5. But Albany would wake up during the second and take over the game. 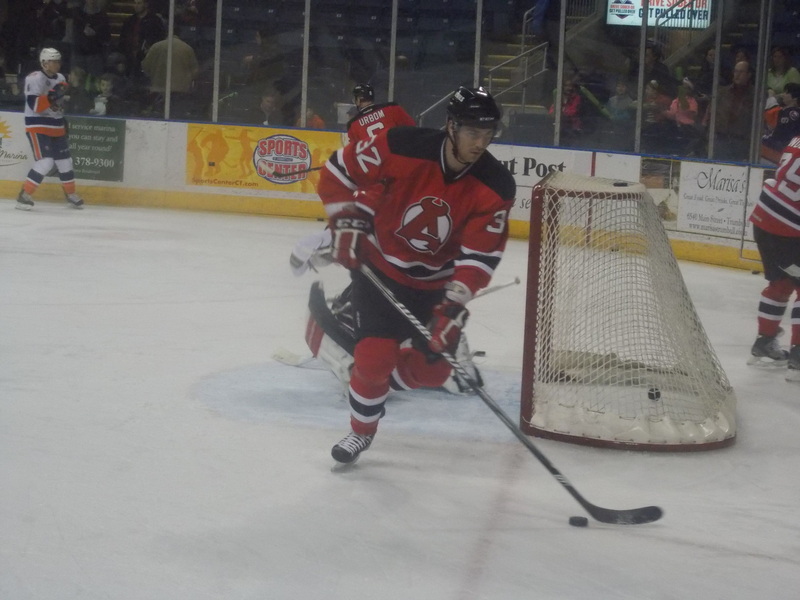 Mike Sislo scored 2 minutes in to retie the game at 2 (assists went to Boucher and Jon Merrill). Joe Whitney would add his team leading 25th goal (with another assist from Boucher) on a power play 5 and a half minutes later to give the Devils the lead. 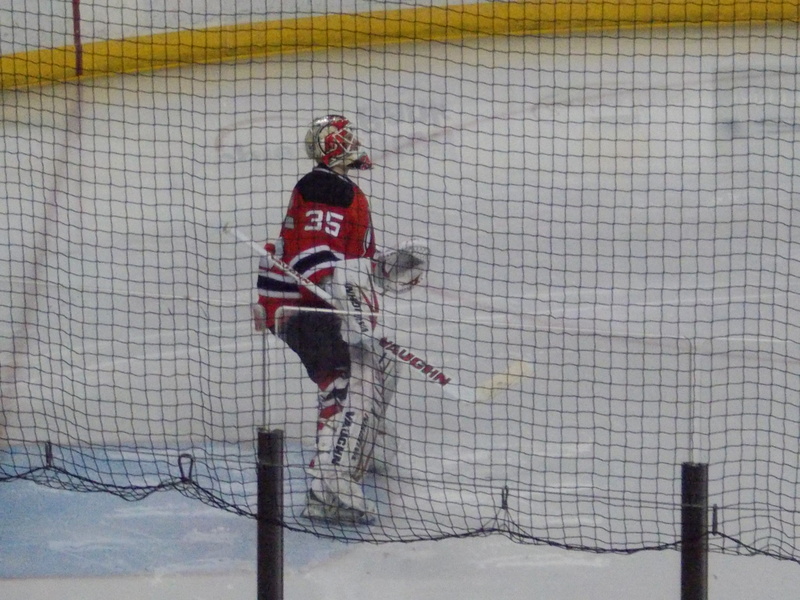 Sislo would add his second goal of the period 3 minutes later for a 4-2 lead, causing the Pirates to change goaltenders (second straight night the Devils knocked out the starting goaltender), with Mark Visentin going out for Mike Lee. The change seemed to shift momentum in Portland’s direction, as Alexandre Bolduc would cut the lead to 1 with 5 and a half minutes left in the second. Miele had a chance to tie the game late in the period when he was awarded a questionable penalty shot, but Jeff Frazee would deny it. But Miele would eventually get that tying goal, though, with just under 6 minutes to go in regulation. Albany nearly put themselves in a hole when Merrill took a penalty with 53 seconds left, leaving them shorthanded going into overtime. 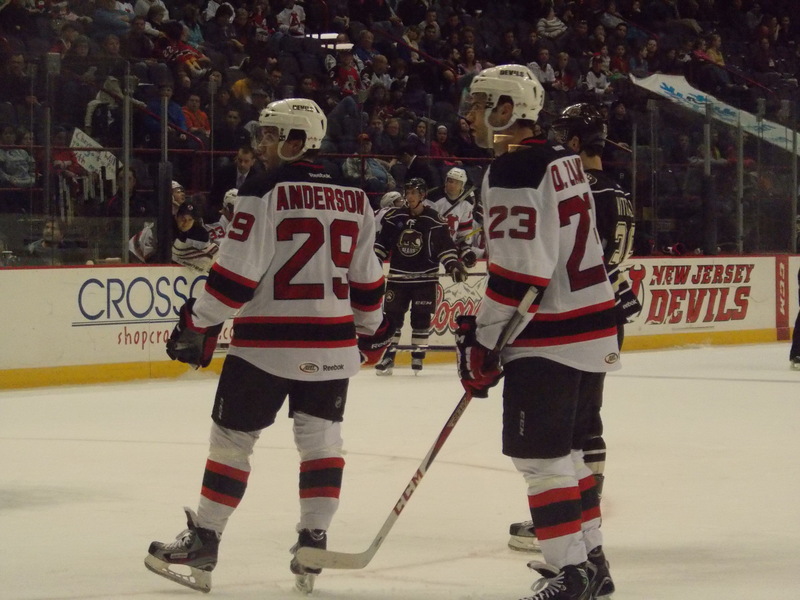 But special teams managed to kill it off, pushing the game into the shootout, Albany’s 14th of the season. It started off well, as David Rundblad’s round 1 attempt was ruled no goal thanks to video replay and Sislo would score. Boucher and Matt Anderson were unsuccessful, while Frazee allowed a goal to Chris Conner but stopped Evan Brophey. Chris Brown scored in the fourth round to put Portland up, but Tedenby would answer with a goal of his own. 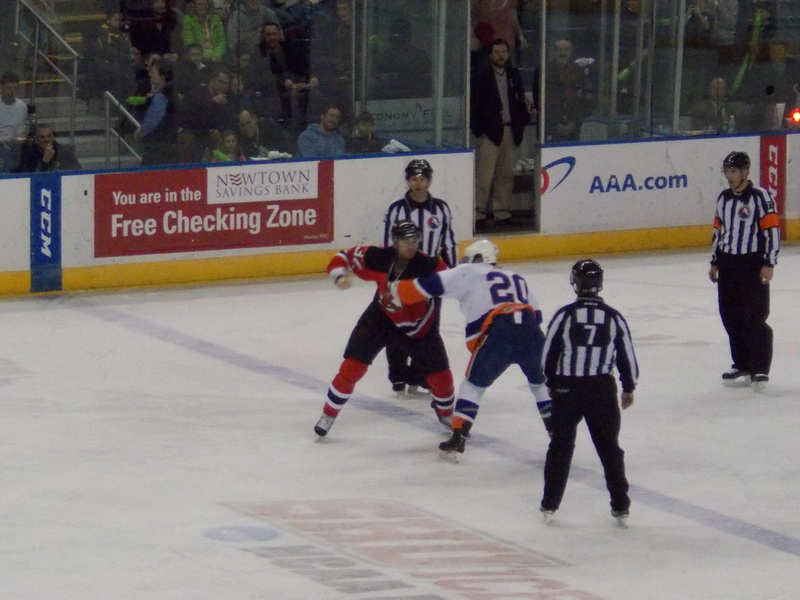 But in the fifth round, Ethan Werek would connect, but Whitney could not match, giving the Pirates the extra point and the Devils their 11th shootout loss of the season. Frazee had quite a busy night in net, and didn’t do too badly, stopping 38 of 42 shots in regulation and overtime, but stuck with the loss. Merrill added two assists in his second game, while paired with Alexander Urbom and at one point Corbin McPherson and playing in all situations. Boucher finished with a goal and two assists in his season debut, earning #3 star of the game honors. 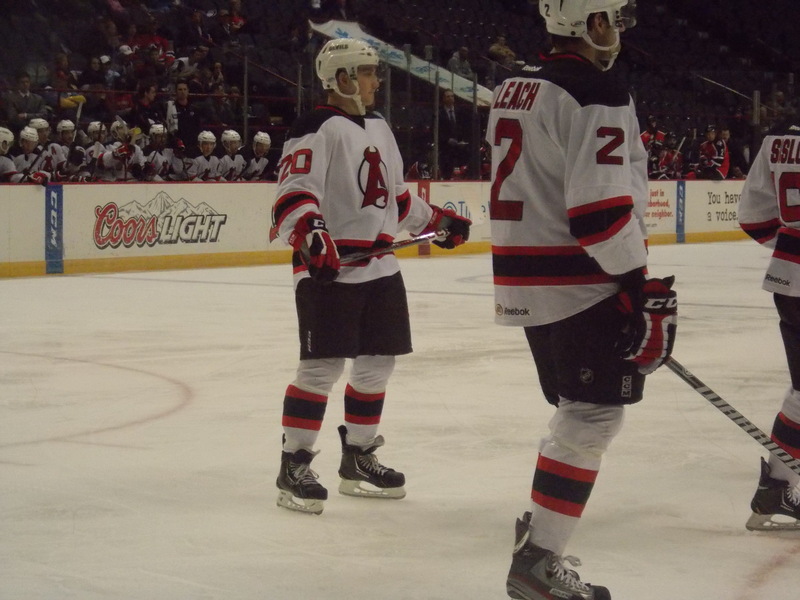 Steve Zalewski and Jay Leach each had an assist (a 2 game point streak for the captain!). No Cam Janssen Obligatory Fight this week…so in its place, here’s the video proof that Friday night actually happened. The Obligatory Goal of the Week? After gaining 3 standings points this week, the Devils find themselves sitting alone in 11th with 68 points. They stand 1 point behind 10th place Manchester and 2 points ahead of 12th place Worcester. As far as playoff positioning, they are 5 points out of the 8th place position, held down by Hershey. There is actually a 4 way tie points wise for first place between the three division leaders (Springfield, Syracuse, Providence) and East 2nd place Binghamton, but the Falcons hold down the #1 spot due to winning percentage. The magic number to clinch a playoff spot stands at 23. -Friday was a busy day transaction wise, as both Jon Merrill and Reid Boucher were signed to amateur tryout agreements. As you read earlier, both players did not disappoint in their debuts. 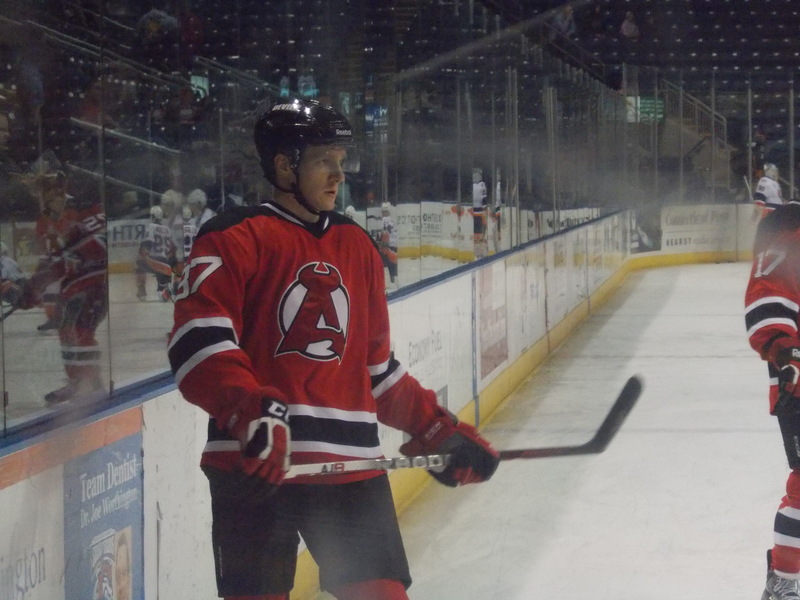 -Saturday Harri Pesonen was returned to Albany after New Jersey activated Henrik Tallinder from injured reserve. He appeared in Monday’s shootout loss to Ottawa after being recalled last Sunday. -Injury update: Jacob Josefson (possible concussion), Dan Kelly (ankle), and Raman Hrabarenka all sat out the weekend. Possible return for some, if not all, players could be this week. Very busy week to start the month of April, with 4 big games on tap (then again this time of year, aren’t they all?). 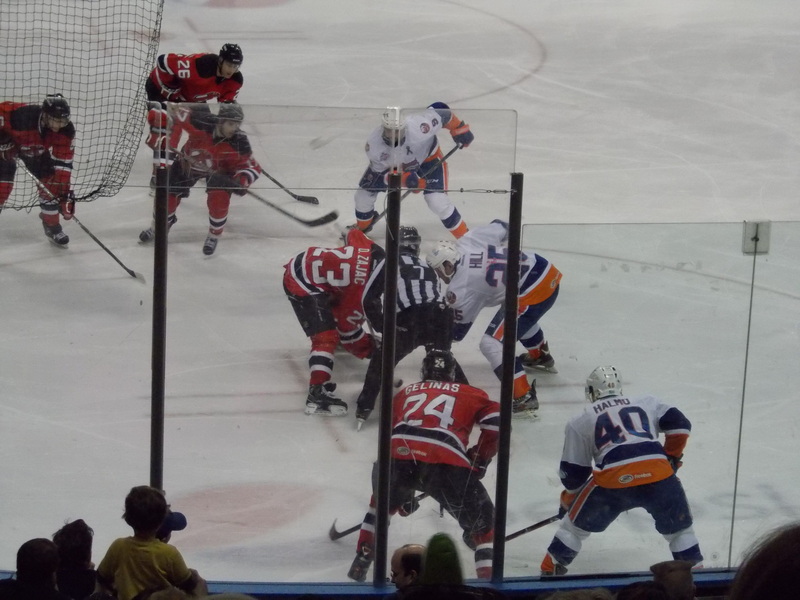 Tuesday the Devils travel to Springfield for a makeup game against the Falcons (originally scheduled on February 8th but postponed due to Winter Storm Nemo). Friday night they host Providence, currently holding down one of the top spots in the Eastern Conference. Saturday it’s off to Wilkes-Barre to take on the Penguins (a game myself and a number of Booster Club members will be attending). Then finally it’s back home Sunday afternoon to host Rochester. Author icepuddlePosted on March 31, 2013 March 31, 2013 Tags Game Recap, news and notes, Roster MovesLeave a comment on Spring Awakening? And we have an actual Harry Young on ice sighting! And more Harry Young, taking on Blair Riley.